Our Alumni MEDfOR students, often found a job within a year after graduation. Roughly one third of the students have decided to pursue a PhD after graduation or stay in academia doing research. Half of the students have gone back to their home countries, some to their old posts – such as lecturer at Universities - while others had landed new jobs, in private entities, public administration, etc. Several students have launched an international carrier in international organizations or as consultants. 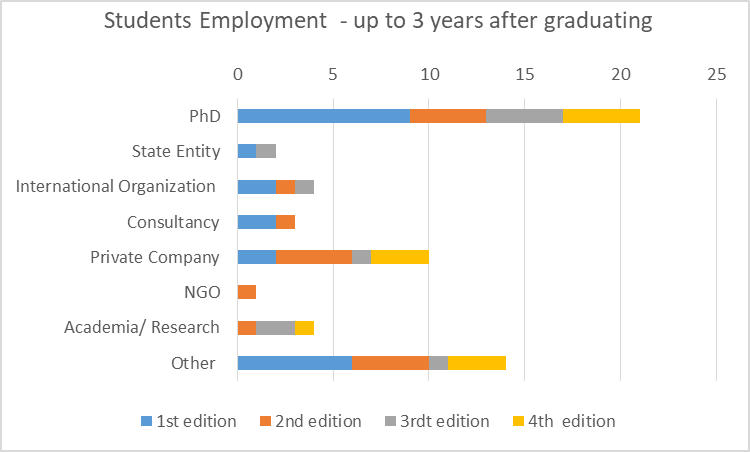 Some students, stayed on the universities were they graduated – doing research or PhDs; while others found internships and job with the associated partners. "After completing the Masters I continued working for The Food and Agriculture Organization of the United Nations (FAO) and Bioversity International as a consultant. However, in June 2015 I joined the international third party organization Bureau Veritas as a Social and Environmental Auditor in Madrid, Spain. In this regard, I perform audits assessing companies against local legislation and certain standards such as Social Accountability (SA), SMETA-SEDEX or client specific requirements as well as Health and Safety (OHSAS) and environmental standards." Research Assistant at University of Helsinki, Finland from June 2016 to June 2017. PhD student at Dept. of Plant Cytology and Embryology , Jagiellonian University, Poland. "I am working as an Independent consultant in Baltic States and Russian Federation ." Project Coordinator at EDAM, Tunisia. It is an agricultural project concerned in local development, which is a partnership between US and Tunisian Organizations. Working in the Institute for Research in Sustainable Forest Management (iuFOR) ( http://sostenible.palencia.uva.es/) en Palencia, focus on silviculture and adaptive management. Working as a forest Engineer at Gestiverde - Gestão Rural Lda. Consultancy company at Abrantes, Portugal. Geographer specializing in GIS and Graduate Teaching Assistant at Social Science Instructional Labs - University of Oregon - Eugene, Oregon, USA. Chief desk on environment control at the National agency of mines activity in Algeria and member in AIFM- MARSEILLE. Doing a Phd in Morocco, about sacred forests and landscape dynamics. Working at Nippon Paper Industries Co., Ltd. in Japan. Working outside of the field as a customer service representative in Brno (Czech Republic). Research Fellow at The Navigator Company - RAIZ. Instituto de Investigação da Floresta e do Papel Lisbon Area, Portugal. I have been awarded a PhD position at Forestry research center (CREA-SEL)in Italy which in collaboration with University of Tuscia,Italy. PhD in the doctoral program of CLimate Change and Sustainable Devlopment POicies under the University of Lisbon. Scientific research fellow - IPCN Instituto Politécnico de Castelo Branco. I am a PhD student at the University of Washington, School of Environmental and Forest Sciences. I work on integrating climate change into forest management planning. This is my second year of PhD. I owe this amazing opportunity directly to MEDfOR. As a reminder, I met my current PhD advisor through MEDfOR. He was invited as a guest lecturer. Ph.D. student in Climate Change and Sustainable Development Policies (PDACPDS) in University of Lisbon and New University of Lisbon (Portugal). PhD Candidate at Universität Oldenburg, Germany.